After a morning spent listening anxiously to Radio 4 about the dangers of sugar, I decided to transform the remainder of the weekend into a healthy eating extravaganza. I began by googling such phrases as “a sugar free life” and “sugar free children” and “can life be fun without sugar” and once I’d found answers to all but none which I really liked, I went it alone. First stop, no more apple juice. “But I love apple juice” said my youngest, “it makes me run fast like Mo Farrah”, a small tear dripping down his cheek and bottom lip quivering. This is what I was afraid of, they are already hooked. Addicted to apple juice and not liking the sound of “cold turkey” one little bit. So I started gently with water and the tiniest bit of my own addiction, High Juice….basically orange squash but with half the sugar, or so it claims. But it colours the water and is definitely better than the sticky liquid they so crave. I’m going to try freshly squeezed orange juice in water today – minus the bits, no one likes bits. The water worked, they like water, they drink loads of water, it’s me that buys the apple juice. And it is also me who bakes the cakes when I can’t think of anything else to do and I’ve a bowl full of fresh eggs straight from Harriet, Henrietta et al. Baking is great as it takes up quite a bit of time, everyone can join in (if you remain calm) and there are bowls to lick out and delicious things to eat at the end of it. Everyone wins. There is also A LOT of sugar and white flour in cakes which isn’t so good and so I needed an alternative. It was raining here yesterday so after we’d built the 5th lego robot, played indoor bowling and made a camp (destroyed the sitting room) my only way out was to bake something. 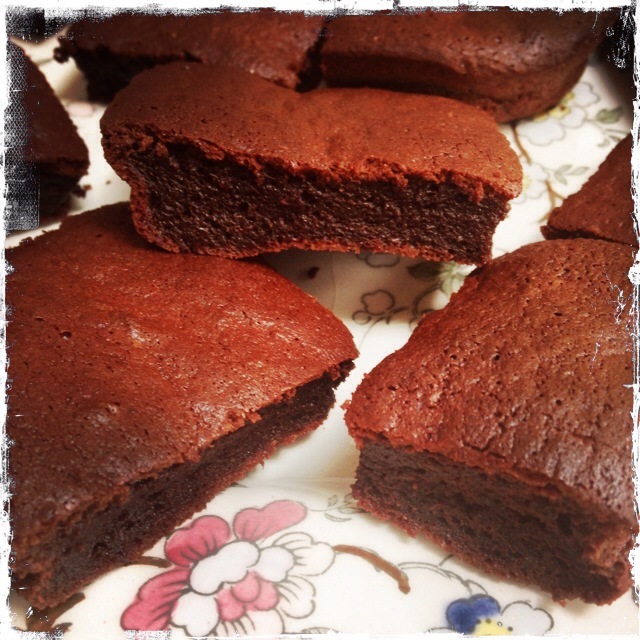 Chocolate and Beetroot Brownies. Recipe found in River Cottage Cookbook by Hugh Fearnley Whittingstall. They were very easy to make – I had fresh beetroot here which I just wrapped in foil and baked for about 45 minutes and then peeled. I don’t see any reason why you can’t make these with the pre-cooked beetroot though. The recipe uses dark chocolate, very little sugar and just a sprinkling of flour so I’m telling myself it was healthier than regular brownies and a good way of sneaking in beetroot to a child’s diet. My youngest – who generally eats nothing but avocados and pasta – absolutely loved them, my eldest was not quite so sure and managed to find a “red bit” in his which I tried to tell him was strawberry but I’d already lost him. Anyway, they’re pretty good with a cup of coffee, or hot water and lemon if you prefer, and the mixture is the most incredible colour which alone made this a very worthwhile experiment indeed. We’re going strawberry picking today, I know fruit is seen as the devil of the sugar free world but surely strawberries don’t count?